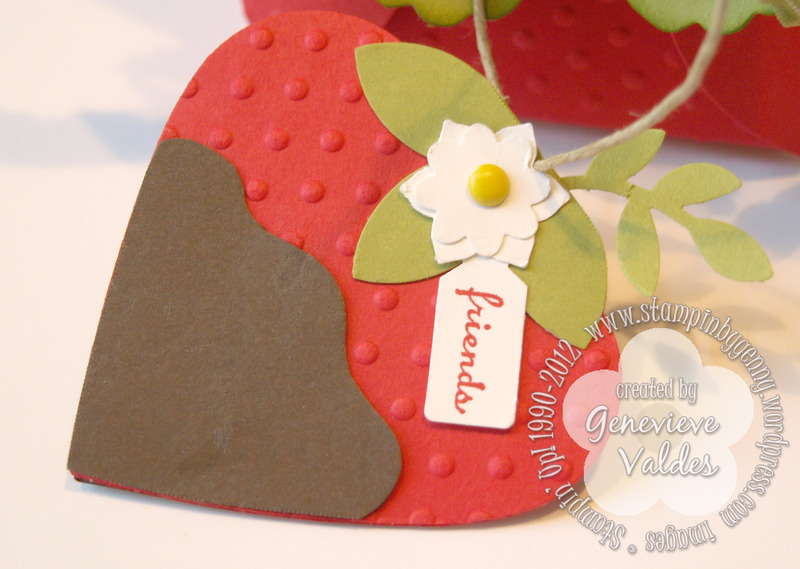 Juicy red strawberries were my inspiration for this week’s fruit challenge at Hand Stamped Sentiments. I love shopping the produce section. Vibrant colors and fruit displayed to show it’s freshness. Strawberries are in abundance at my grocery store. 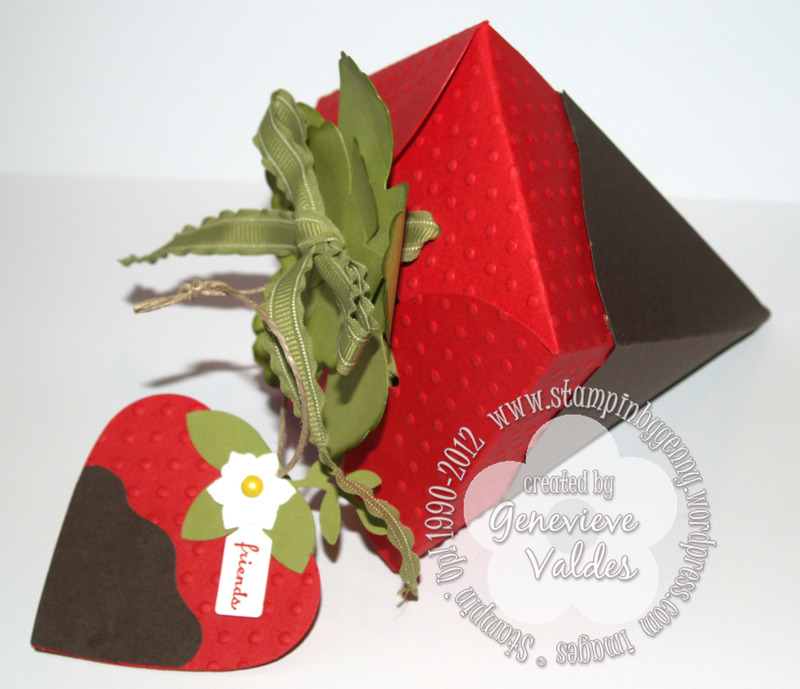 The clear boxes filled with juicy strawberries got me to thinking I could make a strawberry out of the Petal Cone die and to make it more decadent I thought chocolate dipped! Here’s my creation complete with tag. See below to download the tutorial for how to make this gift set. Click here to download the tutorial complete with photos. Please join us this week at Hand Stamped Sentiments. Also take a look at the amazing projects from our talented design team. 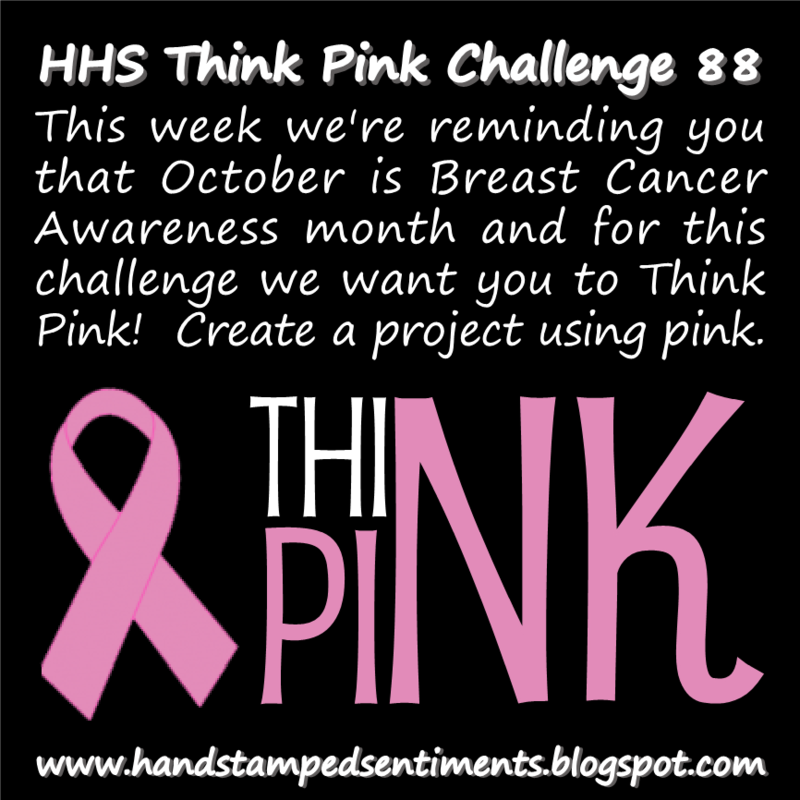 This week at Hand Stamped Sentiments the challenge is to Think Pink! Create any project with pink. October is Breast Cancer Awareness month and HSS would like to remind you that early detection is the key. For my card this week I was inspired by having a friend to encourage and remind you to do your monthly exams and to schedule a mammogram. So my card this week features two owl friends or in this case bosom friends. I hope you participate in this challenge. 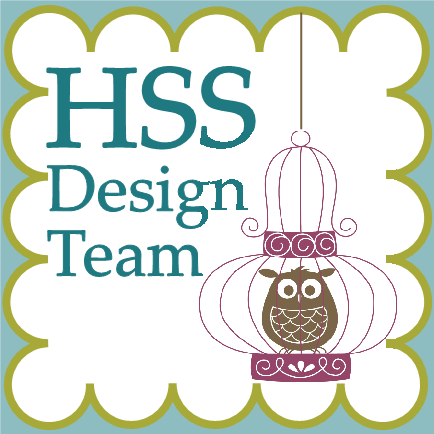 Hop on over to HSS and see more inspiration from our design team. Think Pink! 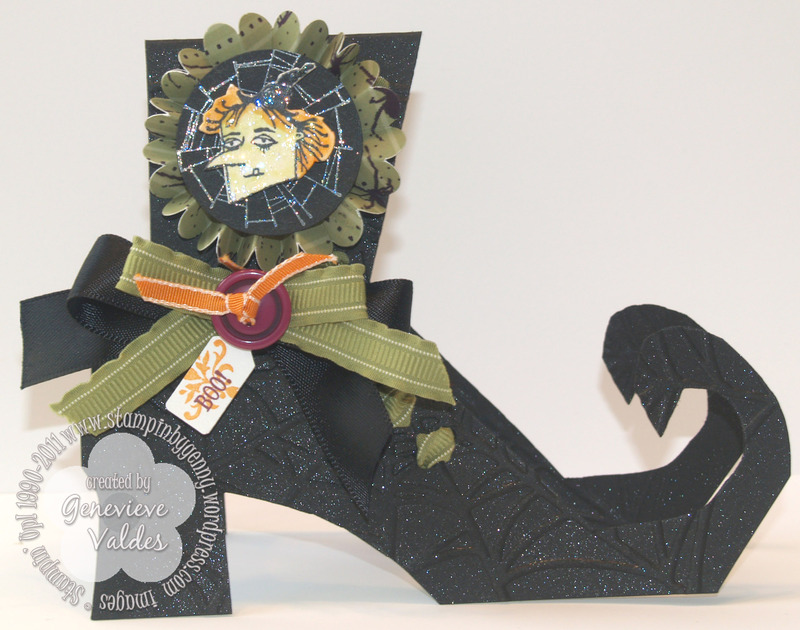 This week’s challenge at Hand Stamped Sentiments is Halloween! I love this holiday and this year Stampin’ Up! has some very fun and spooky stamp sets. Check them out in the holiday mini. Since I love shaped cards I made a template of a witch’s boot. I based it on the boot in the Spooky Bingo Bits stamp set. See card recipe below for template. 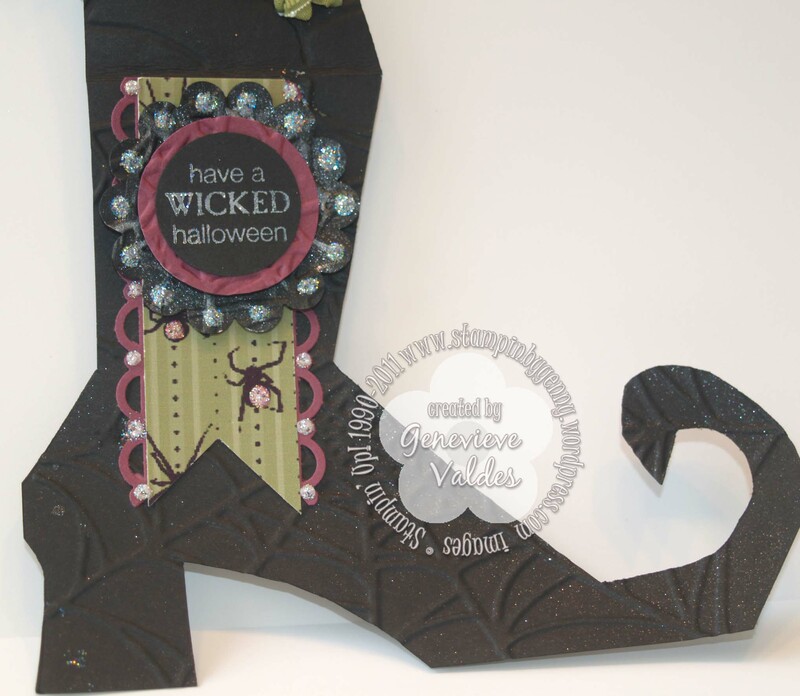 I cut the boot out then embossed it with the Spider Web Embossing Folder then Smooched it. I laced it up with Lucky Limeade ribbon and embellished with a fan fold. I then stamped the head of the witch in the Howl-O-Ween Creeps set on watercolor paper, with a blender pen I colored it with Pumpkin Pie and Lucky Limeade classic ink then used the Dazzling Details to add some sparkle. Finished off the boot with Black Satin ribbon, taffeta orange ribbon and Rich Razzleberry button. 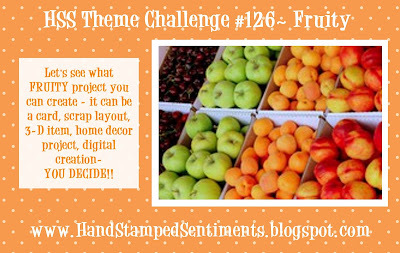 Join us at Hand Stamped Sentiments and take the challenge. We’d love to see your projects. Template: Click here for template. This week at Hand Stamped Sentiments we want to be impressed. 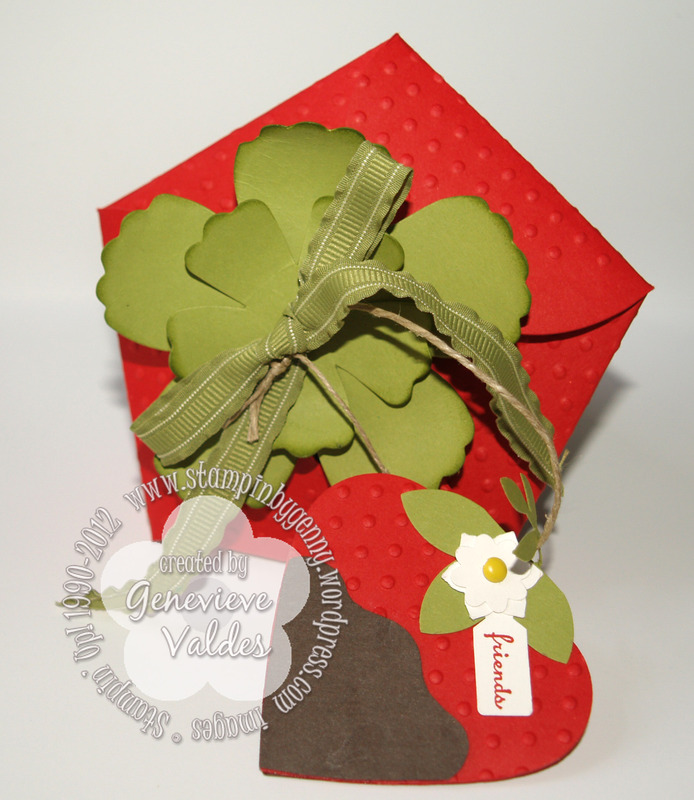 Create any project with dry or heat embossing. For my project I was inspired by a gift from a dear friend. She brought it over this evening and I am so fortunate to have such a wonderful friend. I had a different card planned for this week’s challenge but I’ll show you that card for next week’s challenge. This card I CASED from my upline Tara Bazata. I basically used the same layout but changed up a few detail. I used the Charming stamp set which hasn’t seen ink for a few months. I stamped the medallion and embossed the background and used torn edges and sponging to the layers to add more texture. 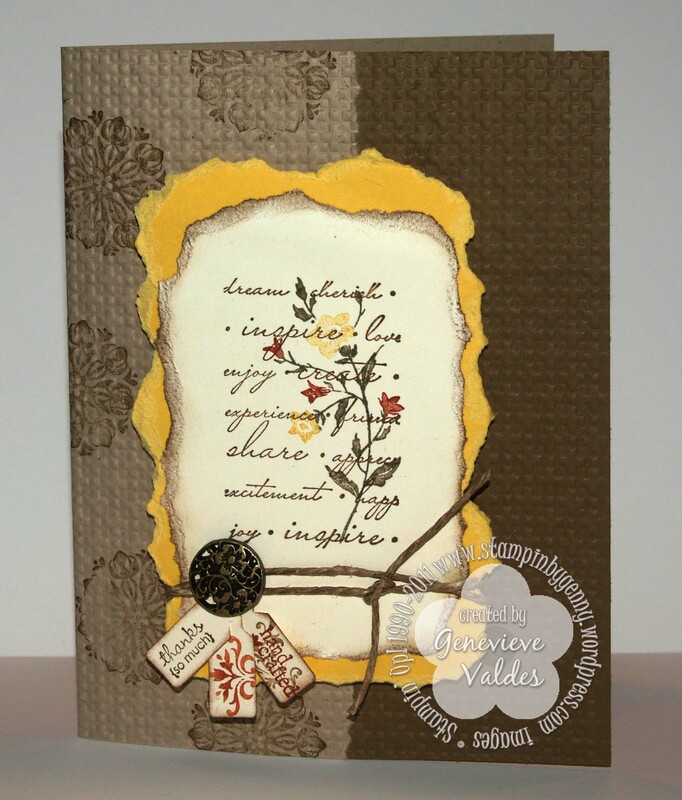 Hop on over to Hand Stamped Sentiments and see all the wonderful inspiration from our design team. We’re prepared to be impressed by your projects.